Clinical Assistant Professor of anesthesiology nursing in the Nicole Wertheim College of Nursing and Health Sciences. Dr. Glymph started his over 20 year career in nursing as a licensed practical nurse and continued to advanced practice Certified Registered Nurse Anesthetist. Dr. Glymph received his Associate and Bachelor of Sciences degrees from Norfolk State University (1995 and 1997), and his Master of Science and Doctor of Nurse Anesthesia Practice from Virginia Commonwealth University (2004 and 2010). Dr. Glymph is a Governor appointed member of the Florida Board of Nursing. He also holds a staff appointment with Miami Beach Anesthesiology Associates. He has been involved in clinical practice, teaches in classroom, simulation center in the NWCNHS Department of Nurse Anesthetist Practice. 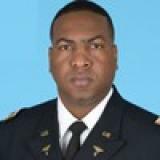 In addition, Dr. Glymph holds the rank of Lieutenant Colonel in the United States Army Reserves and serves as Chief Anesthetist of the 4224th United States ArmyHospital, USAR. Dr. Glymph experiences include Operation Enduring Freedom in Afghanistan along with multiple leadership positions in the military. His research interests include patient safety, simulation, professional advocacy, evidence-based practice, community education, and personal/professional transformation mentorship.